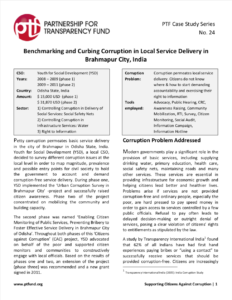 Petty corruption permeates basic service delivery in the city of Brahmapur in Odisha State, India. Youth for Social Development (YSD), a local CSO, decided to survey different corruption issues at the local level in order to map magnitude, prevalence and possible entry points for civil society to hold the government to account and demand corruption-free service delivery. During phase one, YSD implemented the ‘Urban Corruption Survey in Brahmapur City’ project and successfully raised citizen awareness. Phase two of the project concentrated on mobilizing the community and building capacity. The second phase was named ‘Enabling Citizen Monitoring of Public Services, Preventing Bribery to Foster Effective Service Delivery in Brahmapur City of Odisha’. Throughout both phases of this ‘Citizens against Corruption’ (CAC) project, YSD advocated on behalf of the poor and supported citizen monitors and communities to constructively engage with local officials. Based on the results of phases one and two, an extension of the project (phase three) was recommended and a new grant signed in 2011.